Three graves, of three members of a family, buried side by side. 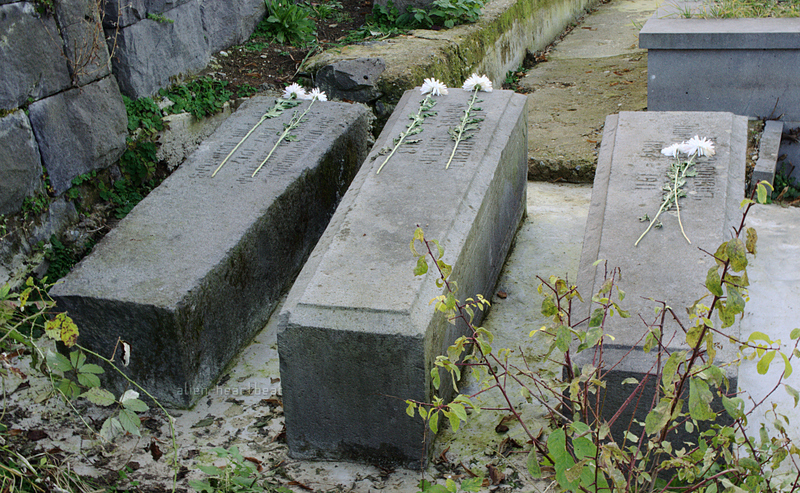 Three old stone graves, each with two long-stemmed white flowers. Each of these three people, with almost fresh white flowers, died a hundred years ago. They were a few of the 1.5 million who died in the Armenian genocide, and despite a hundred years, Armenians will not forget them. These hundred year old graves were in an isolated reach of an isolated cemetery, yet someone still came. If you dig a few feet in the soil here in Echmiadzin you reach bones. Small, frail bones. The bones of the women and children who congregated here after fleeing massacres of their men, their husbands and fathers, in Turkey. 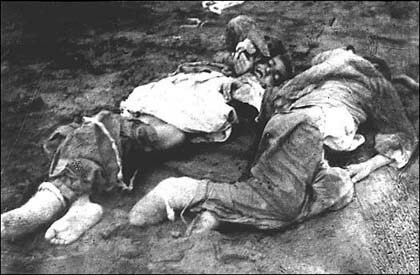 Weakened by hunger, disease, constant attacks and exhaustion, they mostly died where they stood. Sometimes governments do things that an ordinary human would be ashamed to do, even the humans that are their own citizens. One such is the Turkish government denial of the Armenian Genocide [1 ]. Any search for the Armenian genocide takes you to the gray, terrible misery of a hundred years ago: to pictures that make any human weep. This was the extermination for which the word ‘genocide’ was first coined. I can understand that no man wishes to name his grandfather, for it was the grandfathers of the present men [2 ]. But how can a man stand tall, face his own children, and say this did not happen? So the children of today can run amid the graves of their great-grandparents. This genocide did not succeed. Many many Turks do not deny it. 100,000 Turks marched after the assassination in Istanbul of Hrant Dink, a newspaper editor who spoke out against the denial, shouting “We are all Armenians.” Even at the time, some Ottoman officials refused to carry out the extermination orders. Hasan Cemal, the grandson of one of the 3 architects of the genocide, in a groundbreaking act of courage, wrote one of the first books acknowledging the genocide, and the role of his grandfather. I came across it when it fell from the bag of a Turkish man on a plane. He told me the story of the grandson and the book. Armin T. Wegner was part of a German detachment stationed in the Ottoman Empire. 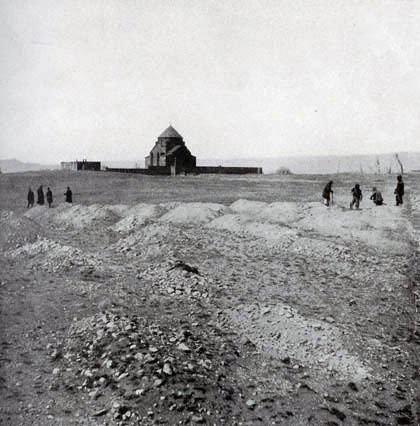 He witnessed, and secretly documented and photographed the desert death marches of Armenians during the height of the Armenian Genocide, for which he was arrested. In Germany Armin Wegner later also denounced the persecution of Jews, for which he was imprisoned and tortured. Few people one comes across in history have conducted themselves with the nobility and conscience of this man. More on Armin Wegner here. Thank you. I am aware of at least two members of my family who fell victim to the genocide: one, a member of the Turkish parliament, author and lawyer – Krikor Zorab – and the other a school teacher. As the Nazis proved in the last century and as humanity has continued to prove in the Balkans and Africa, the capacity to commit such an atrocity is not unique to the Turks, but what leaves me flummoxed the most is the inane intransigience of the current Turkish government to acknowledge what happened even though it has the stellar example of Germany, a nation state which owned up to its culpability, regained its moral stature in the world’s eyes and which continue on to prosperity. I don’t know the state of the Turkish law at present, but it is within my memory that a Turkish citizen could suffer criminal sanctions if he or she acknowledged the crime against the Armenians. I think there is much more open discussion about it in Turkey now, and increasing pressure from the people. The book by Hasan Cemal is now openly available. But there is still a very vocal and slightly violent (assassination of Hrant Dink) right wing movement who either deny it or believe it was justified. Really well-written, presented, and researched. Now I’m going to have to go learn even more about this atrocity. I’m so glad this genocide did not succeed, as you say. Still, it is all so so sad. Yes, they all make you choke. This one was notable because it was the first of modern times, the modern times in which life was supposed to be no longer worthless. An unthinkable thing, a horrible time. It recently blew my mind, when I heard that the people of Germany didn’t know until the 1980’s, of the Holocaust. It’s staggering how recently genocide has been committed, in Rwanda, Bosnia, Yugoslavia, Herzegovina… and the Middle East, by the US. And as far as I’m concerned, Haiti as well. I appreciate your photos, and your writing/reporting. All too often, people do not want to look at, or see, the ugly side of life; of history; and humanity’s inhumanity. In law, and in origin, genocide is the destruction of an ethnic group. The Hutu campaign against the Tutsi constituted genocide. But some of the others you are referring to may be more properly called “crimes against humanity” rather than genocide. It is important to use the correct term because if we don’t the words get degraded and big important words lose their impact. The advertising industry does this all the time, but we should not be a party to it. Thanks. You’re right about correct and careful usage of words. It’s too easy to cross the line of “crimes against humanity” into genocide. The distinction being intent? It’s equally disturbing. Came across a blog recently, debating this very issue as it pertains to the Irish Potato Famine, and British involvement. Underpinning requisites you have cited for genocide (and, indeed, any crime against humanity) lay the prerequisites of a competition for a perceived or confabulated limited resource, an unwillingness to share and the use of one (or more) characteristic element of our competition for the resource as the excuse for depriving them of their share (and tragically their life.) 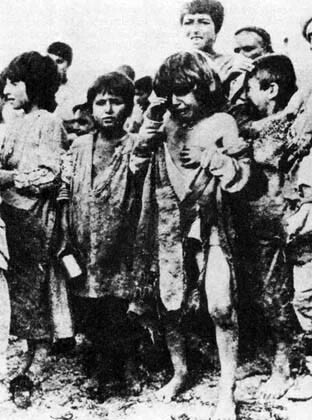 The rabid Turkish nationalism that rationalized and sanctioned the genocide was, in part, a response to the economic and physical displacement of Turks from countries where the Ottoman Empire’s sway was collapsing thus forcing them back to Turkey where they found that the jobs and economic resources they needed were in the hands of their once welcomed neighbors – Armenians and other minorities. It therefore was easy to stoke the flames of bigotry and de-humanization of the “interlopers” that led to the genocide. By the way, we should never believe that humanity has grown past this propensity or that we, in countries as wealthy as the US, are immune from such group madness. Yes, I agree we likely have not grown past this. However competition for resources, and resentment toward minorities is always an issue for those at the bottom of the economic ladder. It doesn’t erupt every day into genocide. This wasn’t, and most genocides aren’t, bottom up. This was driven by elites wanting to solve “the Armenian question” while the West was distracted with WWI. (Small correction – WWI .) I agree that genocide is led from the top but I believe that the top is merely harvesting the emotions at the bottom. Your posts and the responses they are evoking are valuable opportunities for human engagement and I laud you for undertaking your trip and the blog. All the best. Thanks John, and thanks for the correction. That, is the most disturbing. That we have not grown, past it. And that no one is immune. I think you will leave there a different man. Again, this is one of those posts that it seems obscene to “like.” Thank you for sharing this. I remember when Barack Obama was running for president here, he said he would address the Armenian genocide and see that we here in America referred to it as such. But he back pedaled and made me mad. One of the most spiritual churches I have ever been into is the Armenian church in New York City (Manhattan) on 2nd Avenue. They would let us hold our Jamaica Progressive League meetings there. Lovely people. Did you ever see the movie on Arshille (spelling??) Gorky, the artist? Excellent. It is part fiction, I think, but covers the genocide and of course, Gorky himself, who is/was Armenian. Thanks again. Great post. Independently of politics, I think Obama is a decent man, and his failure to mention the genocide has been a disappointment. The problem has always been the strategic importance of Turkey (less so with the fall of the USSR, but more so with the issues in Iran and Syria) which gives the Turkish government significant influence on other governments. Obama was likely cautioned by the State Dept. Ashile’s mother died of starvation in the famine in Yerevan that followed the genocide. I like his painting “The Artist and His Mother”. Despite the modern technique it has a really Armenian feel. I agree, we need an alternative to “Like”. My choice is “Struck By”. Without knowing the details, I am guessing that is likely to be true. But I think the previous poster was referring to “when Barack Obama was running for president here, he said he would address the Armenian genocide”. People always hope that more will come from the next president than the previous ones. Oh, if you are anywhere near the city/town of Yerevan, you should see The Hanging Gardens of Armenia (and post pictures!!!). I walked up and down the hanging gardens a few times (for practice) but took no pictures: it looks disappointing – the whole top area and the upper sides look like a construction site. The problem is the international donors who funded it became irritated by the govt corruption on the project and withdrew support well before it was finished. Of course I could have focussed the camera on the areas that were complete, but that would have missed the massive scale of the thing, and it is really the scale that is its most impressive point. The only time it looked really good was one day when it was covered in snow, which covere the construction mess. But I missed the chance that day. yes. if it was complete and if they grew more green on it it, it would look amazing – like a modern day “Hanging Gardens of Babylon”. Honoring those past and present — Armenia, oh Armenia. I had heard an opinion that the govt is afraid that if they admitted it, the military would use the subsequent violent reaction of the right as a reason to step in. A theory that is not implausible. Beautifully written… haunting… emotive… and yet another indictment upon the human race. 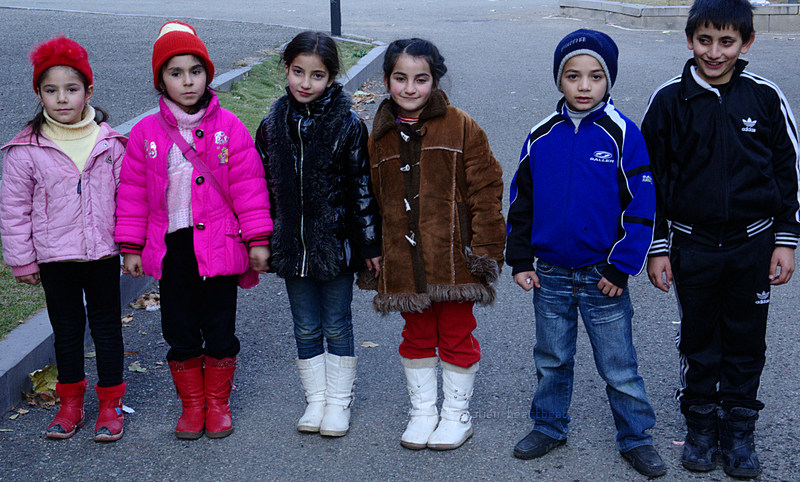 Gorgeous photo of the Armenian children… six little miracles! Thanks very much. And I have to agree about that last picture – the picture of the 6 kids is my favorite image of the walk. They were just horsing around and I asked if they wanted their picture taken, so they all lined up, the girls held hands, and I clicked. I look at those beautiful little faces (your last image), and feel hope for us all. Yes, I fell in love with them. I carried that picture for ages till I knew where it belonged. 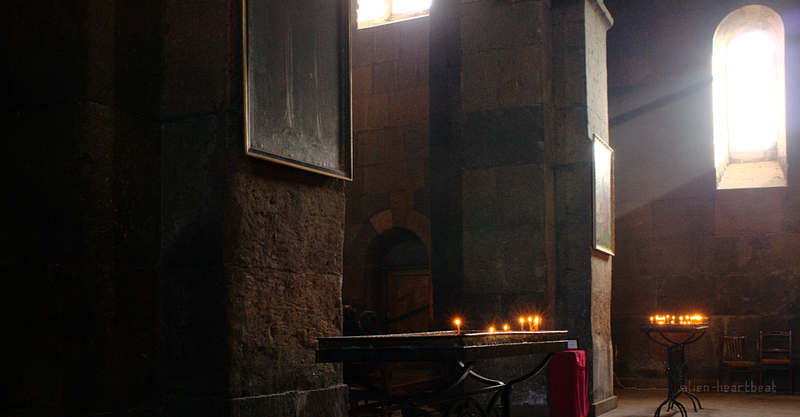 It is the last picture of the Armenian journey. Unimaginable horror & tragedy! How could one man do this to another? What were the hearts of such men made of (or did they even have one in the first place)? I really wish a detailed study is done on such cold blooded men, so we know what exactly was wrong in their biology and then be able to fix that problem in other such men capable of such violence… Why? Just why cant man live and let live? why is the term ‘peace’ so hard for him to understand?…. Apes are capable of similar behaviour to members of other ‘communities’. So it seems to be something we evolved with, not surprising. One of our goals as a species should be to evolve past our past. At once a well crafted and stark piece of writing. Somehow the pictures of those innocent children serves as a great counterpoint to the thoughts expressed. Thanks Shakti. But it was tough to write. This is,powerful stuff. Armenia is a place I want to visit. Yes, I agree. I had wanted to go there for many years. Powerful post, reading and seeing this it seems like something from the past…sad and heartbreaking. I wish it was in the past. There are still survivors of the genocides in Africa, Cambodia and Stalin’s Russia. But this genocide was a turning point: it was the first in the era of ‘modern’ communications and media. So people in the US and Europe knew of it. Photographers recorded it. And the children of the victims refused to allow it to be forgotten.